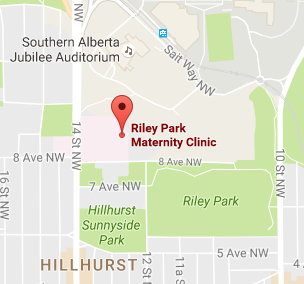 Riley Park Maternity Clinic is located in the northwest Calgary community of Hillhurst. We provide care for pregnant women through to birth and after delivery. Monday to Friday, 8 a.m. – 4:30 p.m.
We are closed weekends and most statutory holidays. Onsite parking is available: $3 for the first hour, then $2 per hour, to a maximum of $10. There is paid street parking for up to four hours. 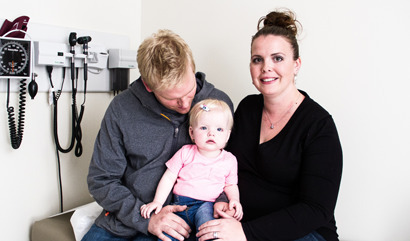 Patients receive care at Riley Park Maternity Clinic and deliver at Foothills Medical Centre. Watch the virtual tour of the Foothills Medical Centre Labour and Delivery Unit on Alberta Health Services’ Birth and Babies website. How do pregnant women become patients of the maternity clinic? Talk to your family doctor about a referral to our clinic. If you don’t have a family doctor, you can contact us directly. Please call 403-284-3711 as soon as you know you are pregnant to book an appointment. Early coordination of prenatal care is important for a healthy pregnancy. Physicians at Riley Park Maternity Clinic will see patients at any point during their pregnancy, but can start seeing patients as early as 10 weeks. What can I expect at my first maternity visit? During your first visit, we will take a full history including your medical and family history, medications, allergies and lifestyle issues. We will review any tests that have already been performed and arrange further tests as required. We will do a physical examination appropriate to your history and stage of pregnancy. Our staff will provide an orientation to our clinic and explain how our call group works. This appointment usually runs 1-1.5 hours in length. What can I expect at my routine prenatal visits? At every appointment we will measure your weight and blood pressure, examine your growing abdomen and listen to the baby’s heartbeat. We will discuss any results of tests performed and explain any upcoming tests, discuss topics relevant to pregnancy, labour and delivery, as well as answer any questions you may have. These appointments are usually 10-15 minutes in length. Group prenatal care is an alternative to one-on-one clinic appointments that combines prenatal education sessions with your prenatal care. If you choose to take part the sessions will start when you are 18-22 weeks pregnant and carry on until after your baby is born. 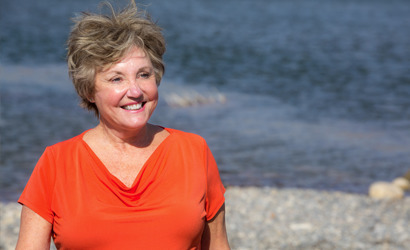 At each of the ten 2 hour sessions, you will join a group of other couples at a similar stage in pregnancy to learn about various prenatal/postpartum topics. The sessions are led by a prenatal educator and one of the Riley Park Maternity Clinic physicians who will do individual assessments of each patient at the start of each session. The option of joining a Group prenatal class will be discussed during your first visit. There is no charge for these sessions. How many ultrasounds will I have in my pregnancy? An early ultrasound (anytime after 7 weeks’ gestation) to confirm your due date. If you choose to do a first trimester genetic screen these two assessments can be combined in one ultrasound appointment. An ultrasound between 18-20 weeks to assess baby’s anatomy and growth, and the location of the placenta. Other ultrasounds may be scheduled through your pregnancy, as necessary. During your 36-week visit we will do a brief ultrasound to check if your baby’s head is down or not. 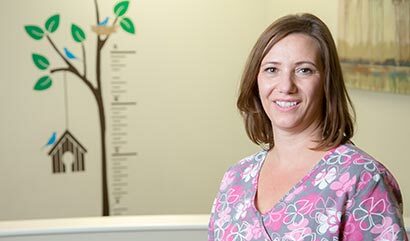 Most physicians at Riley Park Maternity Clinic have had special training to perform a bedside ultrasound scan at your 36-week visit to check on the position of your baby. The position of your placenta. If your baby’s head is not down, you will be booked for an ultrasound at one of the radiology clinics. If your baby’s head is not in a downward position, you will be booked for an ultrasound at one of the radiology clinics. Do I come back to the clinic after my baby is born? We love to see our moms and newborns for a follow-up visit at the clinic. Unless directed otherwise, please book a ‘mom and baby’ appointment for 3-7 days after you are discharged from hospital. We will automatically cancel any prenatal appointments after you deliver, but we cannot replace a prenatal appointment with your ‘mom and baby’ appointment because we book more time for these assessments. At your ‘mom and baby’ appointment we will assess your recovery and baby’s feeding. We will weigh and examine your baby and address any questions and concerns you may have. Often this is the last visit you will have at our clinic for this pregnancy, however, we will follow you, for as long as necessary depending on your situation. 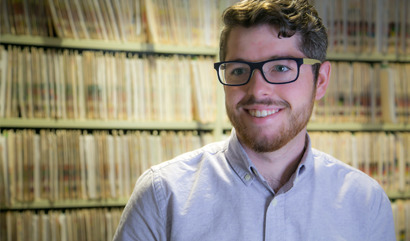 When we return you to the care of your family physician, we will send them a letter outlining your pregnancy, delivery and post-partum care and issues, along with a copy of your prenatal record. Are there fees for non-insured services? Yes, we follow the Alberta Medical Association’s guidelines for charges for non-insured services. Please ask at the clinic. What do I need to know if I do not have Canadian health care insurance coverage? 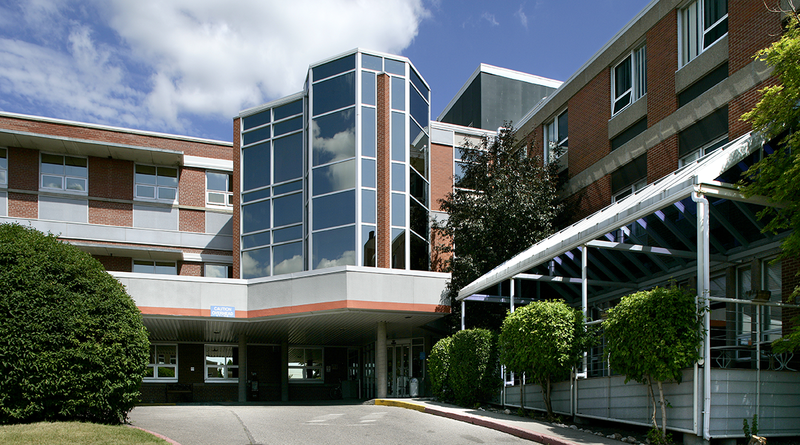 Click here for our information package for patients who do not have Canadian health care insurance coverage. The package includes a checklist to help you navigate the payments that you will be responsible for.